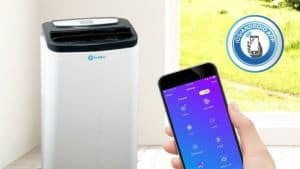 RolliCool Smart Air Conditioners Coming in June | Nerd Much? As we eek ever closer to June, it’s about time to consider cranking that thermostat down to relieve ourselves of that searing summer heat. Many of our home appliances have gone high tech on us, and the air conditioner refuses to be left behind. The RolliCool line of “smart” portable air conditioners intends to lead the pack – and for an affordable price. The RolliCool line is “smart” due to its Amazon Alexa compatibility and available iOS and Android apps. The connectivity of Alexa and the apps makes RolliCool air conditioners accessible from anywhere in the world that you can use your smartphone. So long as you have a signal, of course. There are three different models within the RolliCool line. The 100H, the 310 (available on Amazon right now! ), and the 208. Each of them serves come standard as an air conditioner, heater and dehumidifier. And all three utilize eco-friendly R410-A coolant. Also coming standard is a fan mode, “whisper quiet” 56db systems, and a remote control and digital display. The elite of the bunch is 100H. It sports 14,000 BTUs of cooling power, features high-efficiency carbon air filters and the ability to oscillate. The next level down is the RolliCool 310. It features all of the bells and whistles that the 100H does, however it supplies a lower coolant level of 12,000 BTUs. From the comfort of your couch you can simply tell Alexa to turn your portable air conditioner on or off. Likewise, you can use the iOS or Android apps to set hearing and cooling schedules, choose between different modes and settings, and adjust fan directions or speeds. The line of smart air conditioners with become available in June, each at a reduced price than originally expected. The premium model, the 100H, will run at $529.99 (originally $629.99). The mid tier air conditioner, the 310, will retail at $459.99 (originally $580). And the cheaper model, the 208, will cost $399.99 (originally $480). Buy the RollieCool Cool310 (12K BTU) on Amazon.